#foodporn and #instafood are some of the most popular hashtags used on Instagram and food itself is the thing people photograph and post most frequently. 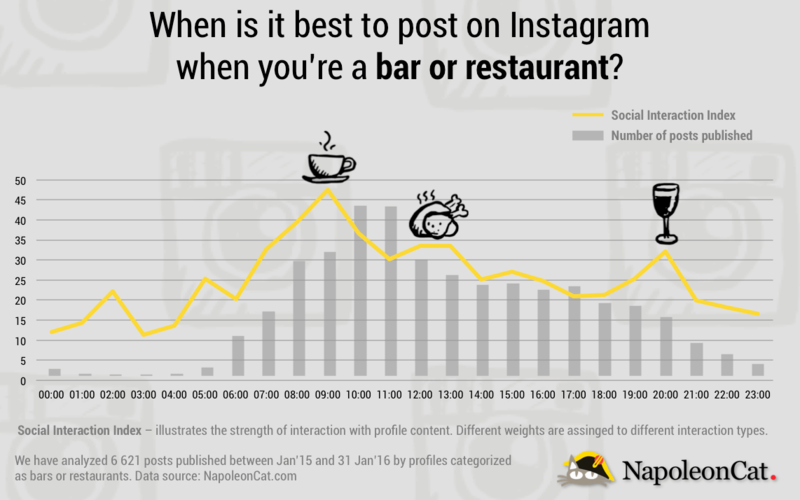 It’s no wonder then that bars, restaurants and all sorts of food joints flock to Instagram in search for their customers. Next to beautiful photos and the right hashtags, proper timing is the key ingredient to successful Instagram strategy. We have analyzed over 6,600 posts published throughout the 2015 by various bars, pubs and restaurants to spot the best posting times for you. The results are pretty obvious, but, as the data suggests, not followed by most. Most of the posts however, were published between 10:00 and 11:00 (a.m.). Dinner time is also heavily neglected by gastro social media managers. So, there is still room for improvement. One explanation to this might be the fact, that probably most of those who manage this type of profiles are the ones directly working at those places. And during peak hours they concentrate on serving you your latte on soy milk rather than posting another coffee art pic on Instagram. If it is so, you guys are excused!